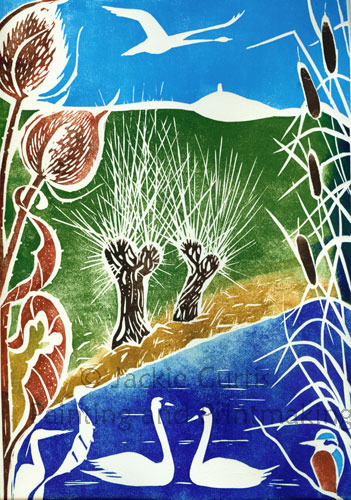 Linocut by Jackie Curtis featuring elements of the Somerset Levels: King's Sedgemoor Drain; Willows, Teasels and birds found on the levels such as Kingfishers, Swans and Herons, not forgetting Glastonbury Tor that presides over the levels. There are also linocuts available in bright colours (see postcards) and a purple sunset rendition. Please contact me if these are of interest.